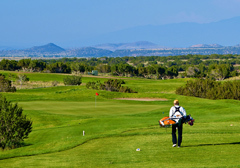 Featured on Golf Life and Fox Sports television networks, Santa Fe’s finest and only municipal golf course offers golfers of all ages breathtaking 360-degree panoramic mountain views, scenic high-desert landscape, exclusive low rates and full-service amenities. For many, Marty Sanchez has been a mustplay course that locals quickly adapted to due to its links style course, well-maintained grounds and visual scenery that so eloquently captivates the colorful splendor of the southwest. Its ability to maintain competitive low rates that surpass local competitors have set this course on the map as an affordable outing for locals and tourists alike. Partake in the championship 18-hole course, 35-station all-grass driving range, practice greens, putting area and a par three course ranked “Top Three Big Little Courses in the US” by Travel + Leisure magazine. Fairways favor accurate placement off the tee to avoid approach carries over large green side bunkers. Greens are a stern test, but uniformly fair. 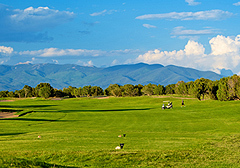 Links de Santa Fe is moderately hilly but walkable. 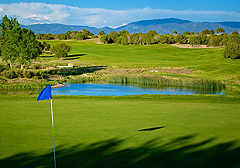 For families, Links de Santa Fe’s “Great 28,” a 9-hole par-3 course, gives players the option of a quick nine before hitting Santa Fe’s galleries, museums and restaurants. Public Course - 27 Holes open year-round, weather permitting. Tee times recommended for the 18-hole course; reservations taken up to seven (7) days in advance. Call the Pro Shop or reserve Online through the website. Facility/Services: Putting Green, Pitching Green, Practice Range, Pro Shop, Carts, Pull Carts, Club Rental, Club Repair, Instruction, Tournament Services, Meeting and Reception Services, Merchandise, Restaurant, Beverage Cart. junior, afternoon, rental, tournament, and Volume Discount Card rates. Getting There: Marty Sanchez Links is Located in Santa Fe just 58 miles from Albuquerque. Come enjoy this long links-style course. From Albuquerque: North on I-25 to exit 276B (N 599). North three miles to Airport Road & 599 intersection; two miles north to intersection at Caja Del Rio. Left at Caja Del Rio, approximately two miles. From US 285: south at intersection onto 599; nine miles to the intersection at Caja Del Rio.